If you are a Penangite and are a Hokkien or at least some relations to Hokkien folks, this is one of the must have dish for Chinese New Year. Almost every home has it. But, the difference is in the flavour of the dish. Some of my relatives cook this but they taste just flat and normal. I have made joo hoo char (ju hoo char) for several Chinese New Years already but somehow, I never make a blog post of it because usually, I fried them in big batches and was too stressed out to bother. This time, I took the trouble to make a smaller portion and show readers the step-by-step way to prepare this. I will break this into two posts due to the number of photos and tips. 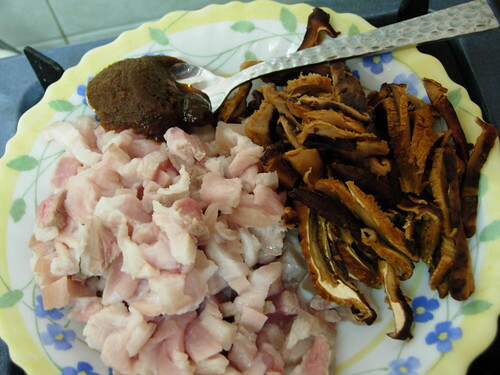 Joo hoo char got its evil good taste from the three-layer pork that we use. You cannot get really good halal joo hoo char. Chicken meat is just too dry. In order to cut these pork into really tiny pieces, you need to parboil it. Dunk the strip of pork into boiling water and leave it to turn colour. Do not cook it, just let it be a little firmer so that it is easier to cut. 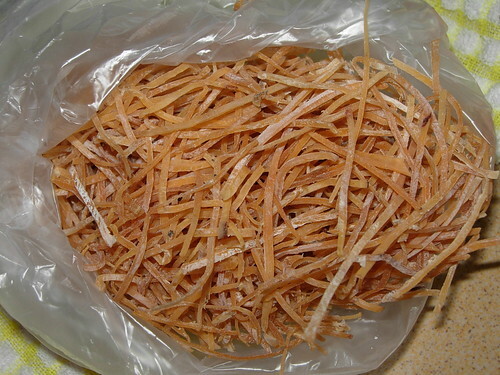 This is the dried squid strips or we call it joo hoo si. Before buying, smell that it doesn’t smell pungent. It has to have a pleasant smell of the sea and not some rotten fish. Two taels (tahils) will be sufficient. 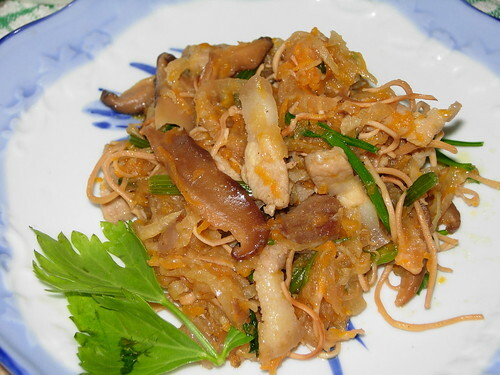 The main vege is of course the turnip or sengkuang or Hokkien call bangkuang. Large or older ones yield better quality. 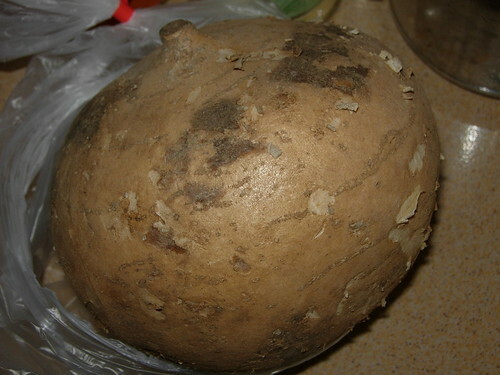 This turnip weighs 800 grams. Avoid getting tiny ones because they are full of sap and will make your dish very soggy due to the high water content. The other vegetables are the carrots and Chinese celery. Some people use spring onions but my mother told me to avoid spring onions because they can cause the dish to turn bad faster. The Chinese celery will balance off the strong smell of the squid. 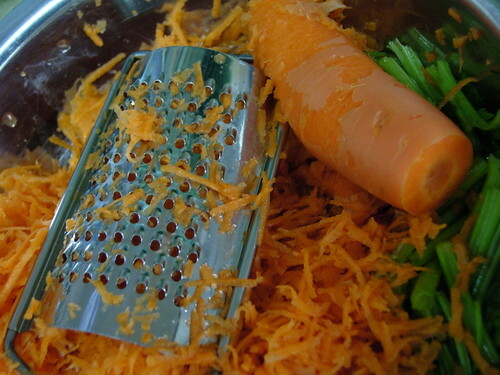 Carrots are easily grated with the grater. It takes just minutes to get them into thin, long strips. 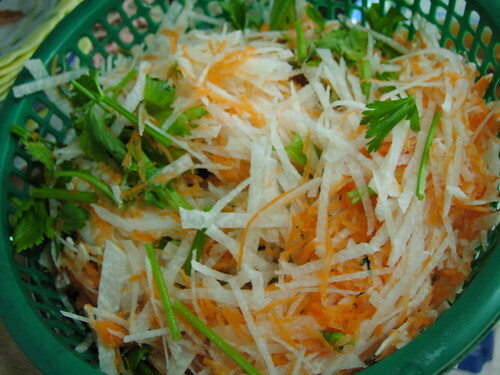 However, avoid doing the same with the turnip because when you grate them, the turnip will turn dry and fibrous. So, what I normally do is to use the slicer to slice them into thin slices. I only use a cheap Mini Wonder which costs me RM7.90. You can find them from most supermarkets. 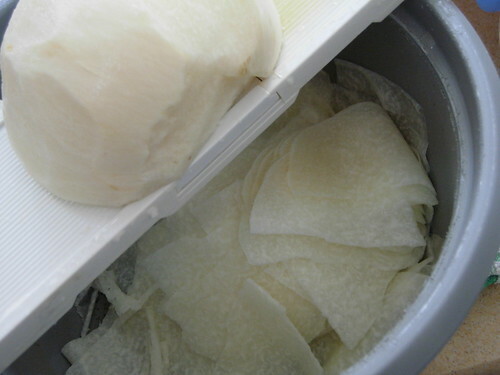 Cutting the slices of turnip is not hard at all and I actually love this process. 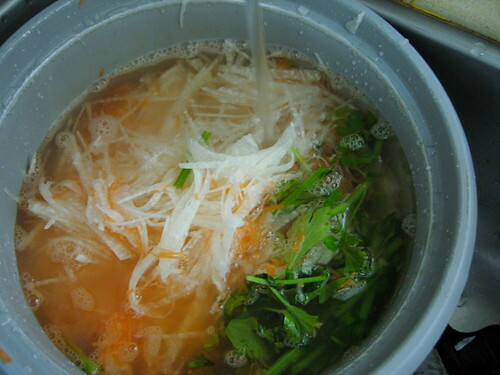 Forget about the strict rule of wanting your joo hoo char to be as finely sliced as possible. When people eat, they don’t see if the thickness are uniform. Just take a big cleaver and slice with no worries. This other tip is what my mom taught me. Turnip has some sap and you need to wash them after cutting. The sap will make your palm feel sticky. 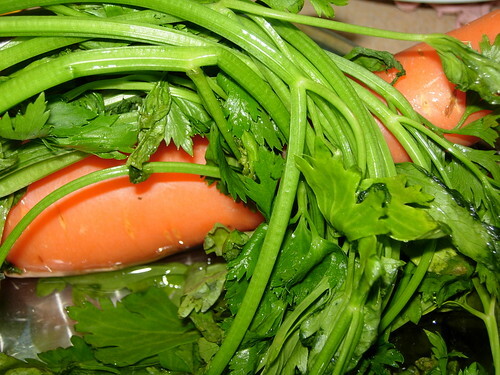 Put the sliced turnip, carrot and Chinese celery into a pot of running water. Mix them well. Then, drain these vegetables in a colander till they are dry. The full recipe is available on Best Recipe food blog. My tummy is barking now. Your recipes and photos are always very interesting and enjoyable. I was wondering if you have ever considered filming your cooking and sharing your recipes on youtube? i’m not a Penangite but definitely a hokkien and joo hoo char is REALLY A MUST for chinese new year. 🙂 thanks to my pho pho! Hi, I ran across your blog today… I grew up in Penang, and reading your blog makes me miss the place! hi, i have tried your recipe. my husband n my daughter loved it. Thanks!! one of my mom’s favourites. When she’s around, I don’t bother at all. Nowadays, when I make “mon guang cha” I will use the shredder she bought for me. I googled for traditional chinese new year recipes and came across your site. I must say I have found your recipes to be very authentic and the ingredients very accurate just like my mother’s. I have not tried any of them yet but feels compelled to try it for this year’s CNY. I have to try extra hard to celebrate CNY becos my husband is Italian. I don’t want my kids to grow up thinking they are white becos they look more white than mixed. Thank you for putting up this site. I love it.